Days are getting lighter now (woop woop!) and thoughts of summer holidays are popping over my head. I was browsing my phone the other day and realised that I have a LOT of places I've visited last year and it would be a good idea to blog about them. One of my top picks is Edinburgh Scotland. The place is so beautiful. What's unique about it is you can roam around the city, do some trekking and visit some museums in a short span of time. Picture above is a view from the castle. To be honest, most buildings here look like a castle. Since the place is situated on a hill, it's picturesque on every angle. We opted not to go inside the castle but I've heard it's lovely. I'd rather spend the day looking over different views outside. Air here feels cleaner and lush greens are all around. Arthur's seat is a mountain AND is located in the city centre. I mean, how cool is that?! If you're living in here, you'll be like... "oh let me trek in the morning and go out for a movie in the afternoon!" You can climb the peak in multiple directions but we picked the moderate ascent since we're not on our proper climbing gear (and to tell you honestly, I don't have any climbing gear teehee!). Picture below was taken on our way up. Gab is a born photographer, he likes to take picture of me when I am not looking. To him, stolen shots are better because there's no facade between the subject's true mood and the pressure to look perfect. Very true. It was spring going summer when we hiked and I was fervently praying that it won't rain! Otherwise, #MuddyAllOver I don't know what to do if it did! Thankfully, after a couple of hours we reached the peak. The view was stunning but I was knackered that day. Be sure to bring water with you and sunscreen too. Some few protein bars will be handy because you'll get peckish (hungry in my case) after going down. This was our first stop the minute we got to Edinburgh. It's a tour (we got the silver tour for £15.00) that gives you a taste of whiskey, literally. I am not an alcohol drinker, both of us, actually. But based on travel reviews, this is a good place to visit. It did not disappoint. I like the mini roller coaster ride with holograms explaining the history of scotch. There's also a brief workshop and on the last part, you get to choose which type of scotch do you like to sample. Since we arrived during lunch time we also tried their restaurant. You can tell that their fish dish is different (from London). It's fresher! If possible, make an advanced booking because the place gets busy during lunch and dinner. It is a haven if you're into anything whiskeys, that's for sure. If you're travelling by train like we did, this is one of the first sights that will greet you in Edinburgh. They have the tourist information centre and just across the mall is a wide array of high street and luxury stores. It's worth stopping over to snap a quick photo or two. I remember taking this photo from the coffee place inside the gallery. If I am a uni student in Edinburgh, this will be my favourite study hub because... NATURE! 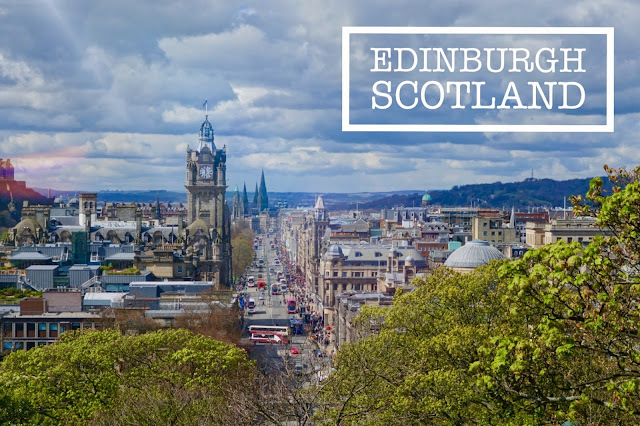 Though Edinburgh is the capital of Scotland, it doesn't feel densely populated. I personally like to hear their accent too. It reminds me of the gorgeous, beautiful people I love from Glasgow! The theme is nature and wildlife when we went there and I was like a kid. My eyes were wide open as I marvelled about the whole idea of earth, life and nature. It is also an interactive museum so it's easy to lose track of time here. My closest friends know this: I'm particularly interested about Holocaust. I remember someone told me it's a bit out of character for me to be curious about such a horrendous era. I don't know, what I recall is that this whole thing started when I watched Dluh in Prague. Dluh is a dubbed version of a Hollywood movie called The Debt. Before watching it, I have no idea what holocaust is all about. I was a changed person after that night last 2011. Son of Saul is about what happened in the Auschwitz concentration camp during World War II. It follows a day-and-a-half in the life of Saul Ausländer (played by Géza Röhrig), a Hungarian member of the Sonderkommando. Film House Cinema has a vintage feel. It has a screen with massive curtain on each side. It is used for theatre plays too. Edinburgh is known for its wool products so we each got a scarf as a remembrance. I don't particularly collect memorabilia when I travel, I'd rather take pictures and that's it. I'm trying to declutter my space recently so if it's not practical and it doesn't spark joy (Hello, Marie Kondo), off it goes to charity. Town is beaming with energy. There are shows like this below. He's a funny bloke. I remember we were laughing the whole time we watched his act. I can't remember why all I know is he's an actor and he's a unicyclist.